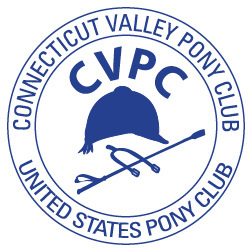 A big Thank You to the Central New England Region of the USPC and Wentworth Pony Club for hosting an inter-regional Mounted Games Rally on Saturday at Green Acres Stables in Madbury, NH! It was a great day with a great example of sportsmanship when the SR division 5 man teams shared players to allow the Wicked team to continue playing when one of their players had to leave. The NYUC Region Sr Team “The Flintstones” came in 1st place overall and 2nd in Horse Management! This team impressed me with how well they came together in a short period of time with last minute pony and stabling changes and played thoughtfully and tactfully. Congratulations to Corrina Mckelvey, “Nick” John Iarusso, Fiona Lorenzen, Maya Norris and Cailey Fay. A Special Thank you to coach Elizabeth Brown for her guidance and making the trip to NH. 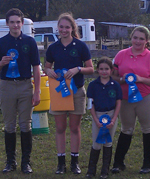 Pony Club families give in so many ways providing opportunities to our riders. Thank you to Mary Jane Fay for arranging the loan of Elphin Kookabura to Corrina McKelvey for this rally. Flintstones You ROCK! Looking forward to travelling to the USPC Championships with you! Entry filed under: Games Rally, Pony Club Regional Rally, Uncategorized. Games Rally 2017	USPC Festival begins!